Just 60 minutes of your time can make a significant impact. 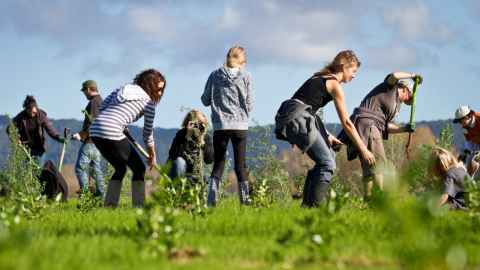 If everyone in the University community volunteered for one hour,that would result in 190,000 hours’ worth of volunteering. That is equivalent to 21 years! That’s why the University of Auckland has teamed up with New Zealand National Volunteer Week to launch Volunteer Impact Week. During this week we will encourage all our alumni and friends to make a positive difference in the world. Signing up is simple. All you have to do is pledge to volunteer for an hour, share your stories and join or organise a volunteer project with other members of the University community. Pledge to give an hour between February 1 and June 30, and fulfil your pledge during Volunteer Impact Week between June 16-22. If this timing doesn’t work for you, don't worry! There will be more opportunities for you to fulfil your pledge. Tell us about the causes close to your heart and why volunteering matters to you, either in writing or in a short video. Include a great photo of you volunteering as well and we will feature stories and images on our social media networks and this website. Register a project for Volunteer Impact Week, or view our current volunteering opportunities. The University of Auckland Volunteer Impact Week (VIW) is a volunteer celebration, awareness & engagement campaign designed to build a movement of engaged alumni that contribute to issues important to Aotearoa New Zealand and the world. VIW supports the University’s For All Our Futures alumni engagement challenge, “Can we increase the contribution our community makes to the world?”, and builds on the collaboration with Volunteering New Zealand’s National Volunteer Week. During VIW 2019, 16-22 June, members of the University community all over the world will come together for the shared purpose of giving back to fellow alumni, students, the University, and their local communities. You can help make all the difference by joining us in this global celebration of giving back. Won’t you join us, for all our futures? Further questions? Email us at alumnivolunteer@auckland.ac.nz.